This post is Part Two in the Decathlon series. Missed Part One, it’s called Help People Cope with and Access the Modern World, Case Study Decathlon (read it here). 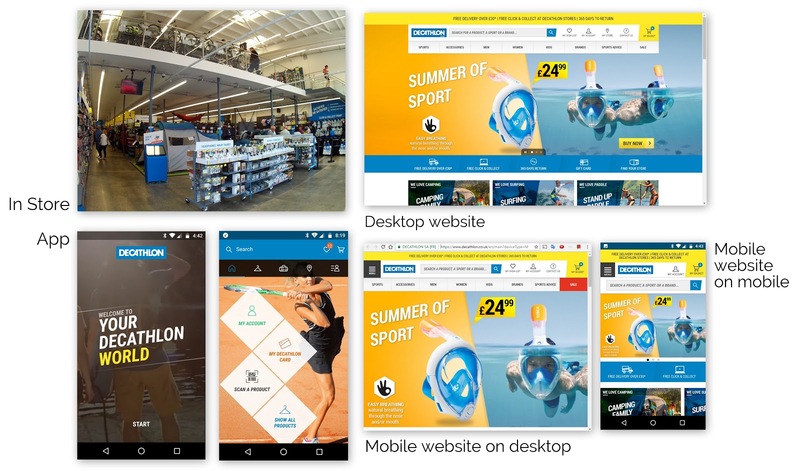 In Part One, you’ll find a backstory on how people (in this case me), found out about Decathlon in about 2001 way before the web and online gripped the planet. Hence the title, cope with and access the modern world as the customer and we as people have many search and buying decisions to make whether physical or virtual. 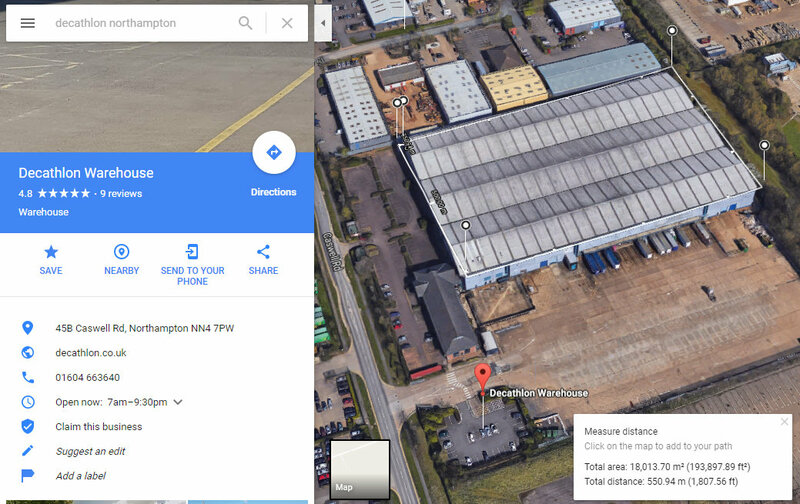 We ended part one with a shell of a new Decathlon Chelmsford store being outfitted in April 2017, with a scheduled opening on 8 June 2017. I had 41 days to stare through the dark glass or get creative and interrogate the website. 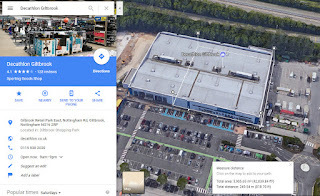 Of course, I was not the only one - thousands of people walk and drive past the new store every day, I wonder how many already know the name and brand Decathlon? 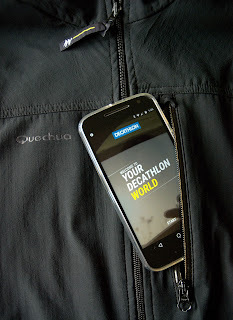 Which is why I’ve used my 12 year old Quechua softshell jacket and with Moto G4 poking out the zip pocket showing the Decathlon App - where old and weathered meets shiny and new. In this part, you will find ideas and evidence on the potential and expectation of a new Decathlon Store - and the way it could operate bearing in mind the network of other stores and warehouses located in England and Europe. This story is about people first, not the technology and not decathlon (as such) - People search for something they want or need and how they may get it. If I had to choose one person point of view it would be an average customer, someone curious and persistent on getting the right product at the right price and in the shortest reasonable time. And how they go about a stepped system of making those choices by searching In Store or Online. In 2017, we would expect that customer to have a touch screen mobile in their pocket, be connected to the internet and at home have broadband access to the internet and operate a WiFi everywhere (as some kind of pseudo human right). At this point, I will mention the term omnichannel again. As a personal niggle, it’s a compound word that’s meaningless to the customer. Those in marketing or business would disagree I’m sure. Even cross-channel or multi-channel is just as meaningless. 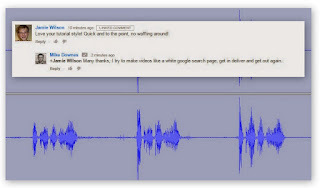 Start talking Online, on the web or Internet and you may be getting somewhere. Thankfully, there are a wonderful set of video by a decathlon Russia lady called Ekaterina. 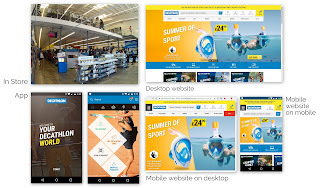 You can watch the video on omnichannel here. 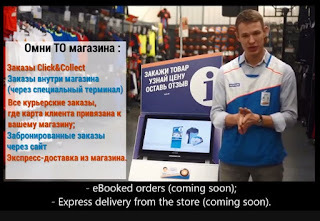 I really like how it's in Russian as this shows Decathlon's reach across Europe. There are 26 videos on the Ekaterina channel and all are excellent. As a teacher, I was taught the term differentiation - that’s to mean making the lesson accessible to ALL the children in the class. I would make an activity as easier for some, average or advanced for those who were able to tackle learning with ease (students would also be grouped, maybe by ability). If a student had poor vision, then they were sat near the board at the front. If someone was hearing impaired, I wore a specialist microphone. If some children learned better with images, I would have have a worksheet with pictures. Once again I mention patience and time - as these are in play every step of the way. An an example, look at the instructions for any flat pack furniture you buy - words are in two dozen languages, pictures and labelled with loads or arrows etc. 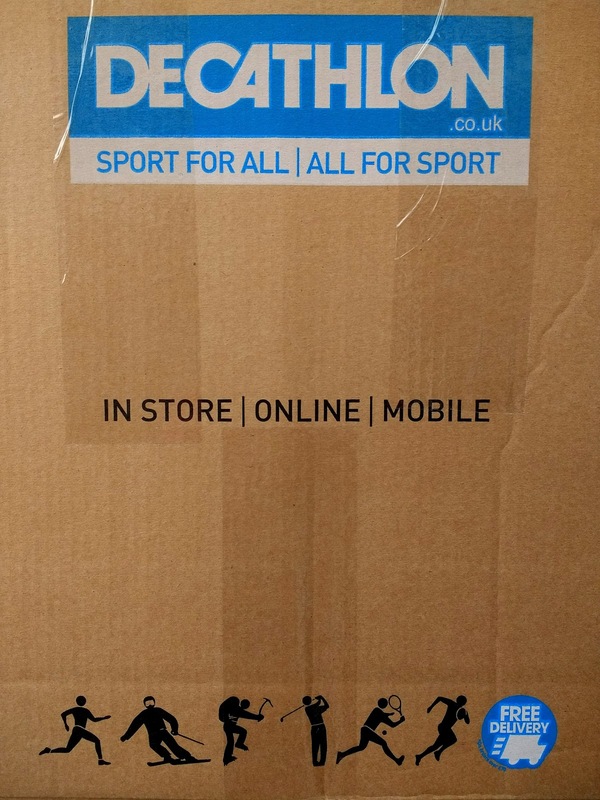 In decathlon’s case selling footwear or clothing, there are sizes or a ‘one size fits all’ label. In the modern age retail store, government, healthcare, banks and anyone else will use many channels like: walk into a physical store/building face to face, use a mobile app, a live web chat, chat on social media and use an old school telephone call - and very old school paper letters in envelopes delivered through your letterbox. 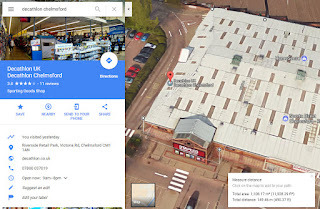 Getting back to the new Chelmsford store, let’s compare the size from above, compare that to Giltbrook, Notts and the warehouse at Northampton (and for fun a warehouse in Lille, France). In theory, the bigger the store the more products are stocked and are therefore for sale in person to the customer. This tells us the new Chelmsford store is half the size of the Giltbrook, Notts store. And therefore when opened, we would expect many products lines to be limited and display areas to be modest. On visiting the Brierley Hill store ten years ago, I had a flavour of this well organised packed in brevity. There are were two floors, lots of metal shelving stacked up high floor to ceiling with slot in hooks, think you know the kind. As a note I think Brierley Hill closed on 2010 to relocate to a larger Wednesbury unit (2,500 sq m and once again very close to an IKEA). Edit 1 Aug 17 - Look at this still from a video about the Northampton Warehouse (watch here). 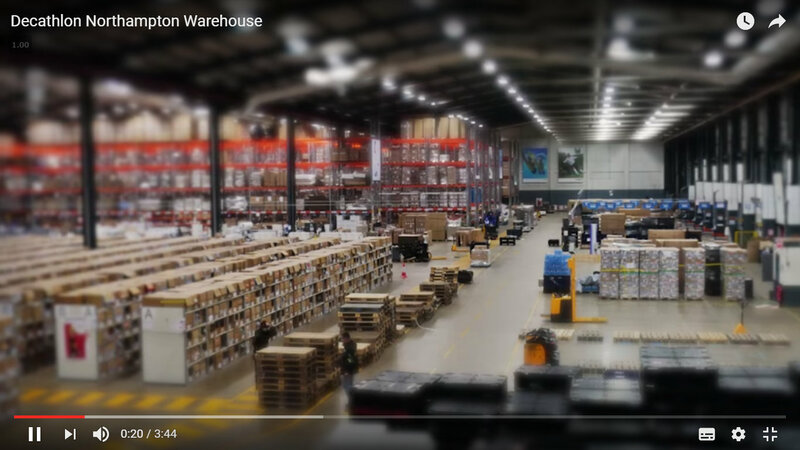 It really highlights the huge logistical challenge to 'all work together, one team one dream' for those 120 people working at this warehouse in at time of recording (in 2016). In our little story so far, and with 41 days until the local chelmsford store opening, the human mind starts to play a lot of tricks. 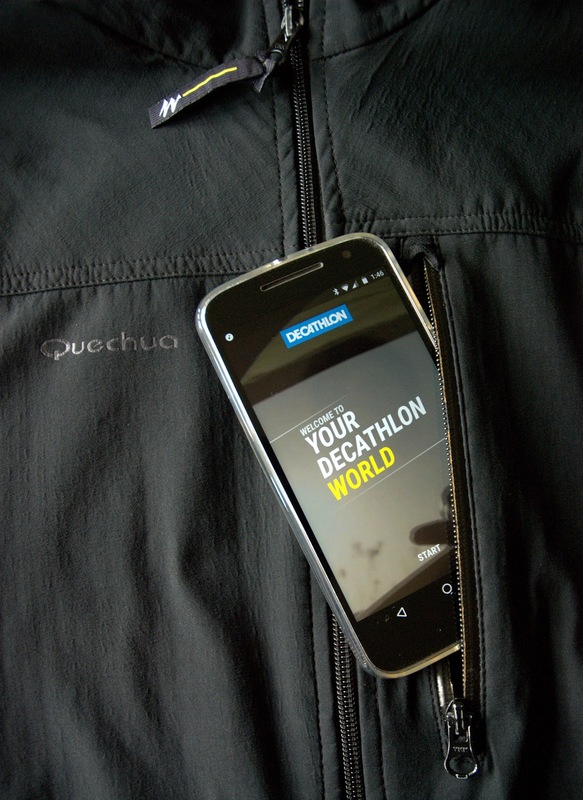 I started paying far too much attention to Decathlon and it's products. I started looking for a new soft shell black Quechua jacket and any other bargains I could find. It’s also where things start to get quite blurry as we easily find and buy anything online these days, but if asked where we saw it first and on what device - we have little idea. Thankfully, a browser history will help, but it’s not that simple. As a declaration, I like to be as pin point and thorough as possible, this helps me and maybe you, to be effective. Old school people may call it doing their homework. But who do we really mean when we talk about people - everyone I guess. Be that, those who are customers, those staff who work at Decathlon, students of business/marketing I guess. Then we can break down those customers into adults and children. No surprise how a highly motivated son or daughter with a mobile laying on their bed or outstretched on the couch will perform a huge amount of searching to get what they want. 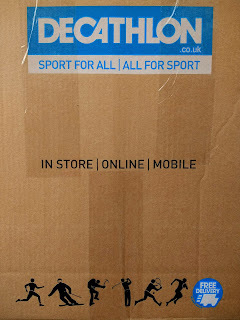 A google search try this “site:decathlon.co.uk money belt black newfeel” click here and see the top result complete with a rating and 19 reviews. Often, a site: google search will perform much better than a search box within a website. This ends Part Two in this series. To sum up, peering into an empty new decathlon store awaiting the opening date is about expectation, potential and some theory on how it should all work. New customers will have no idea what to expect, it’s all new. Yet to use a golden arch fast food example, a new store opening will have customers ‘expecting’ the classic burger, the fries with BBQ sauce an ice cream flurry, a drive thru, free wifi, and for the kids a play area. 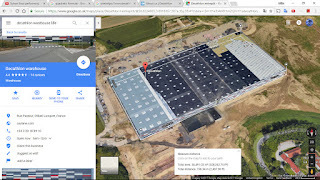 In Part Three we get cracking on the website proper, use many examples, quite a few from my own searching and shopping experience. All in a way to help those of us cope with and access the modern world.